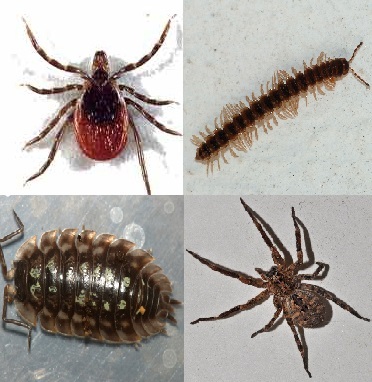 Home / Modern Pest Blog / Which Is NOT An Insect? Which Is NOT An Insect? Which of the following is NOT an insect? If you guessed the spider, you are right, but not entirely. All of these potential pests are arthropods, but not a single one is an insect. That’s right, if you didn’t answer “All of them,” then you’ve been tricked. Sow bugs are crustaceans. It’s true! They’re more closely related to lobsters, crabs, and krill than to ants and cockroaches. Beneath their exoskeleton are gills used to absorb oxygen from water. That is why you always find them in damp areas around the home. Millipedes are diplopodans. A millipede’s body is made up of many segments, and each segment has two pairs of legs. Diplopoda literally means “double foot,” which is the distinguishing characteristic between millipedes and centipedes. Centipedes are chilopodans. Like millipedes, their bodies have many segments, but each segment only has one pair of legs. Unlike millipedes, there are species of centipedes that are venomous. Their bites are not known to be fatal, but they can be painful and some people may experience an allergic reaction. Spiders, as you know, are arachnids. So are scorpions, mites, and ticks. Arachnids are classified primarily by having eight legs and two distinct body regions, the cephalothorax (which is a fusion of the head and thorax), and the abdomen. Now that your world’s been rocked by these interesting non-insects, what is classified as an insect? Three distinct body regions: a head, a thorax, and an abdomen. On some insects, like ants and bees, these regions are clear, but on others, like cockroaches and termites, they’re not so clear, but they are there. Two antannae. Sow bugs and centipedes have antannae, but they do not have the three body regions. Spiders have palpi, which have similar and different functions and an insect’s antannae. 3 Pairs of Legs. All of those listed above have more than six legs, which should be your first indicator that they’re not insects.